Great depth of field on this one Eric! 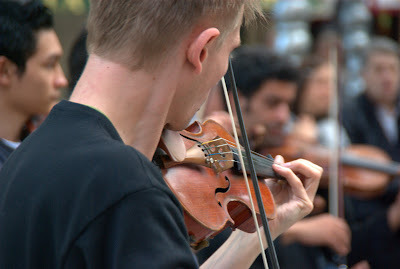 I didn't know that about playing music on the streets of Paris, but it's a very interesting thing to know! Beautiful composition, Eric. Not a bad looking neck, either! I do hope that law is fairly liberal. I've never heard any music on the streets of Paris that I wanted stopped. except for the Fete de la Musique (Music Day ?) that will be very soon, next week end on Sunday 21th ! Another great (though not the famous) angle, Eric. The festival goes on 'til Sunday. I'll try to post a few photos tomorrow. Love the photo Eric. 5 days of work.......ha. mutter, mutter...lol. I can't imagine a city which allows graffiti to be written around the place but fines you if you play music in the streets! Doesn't add up to me. The Castle of Cheverny in the Loire Valley looks like a fine venue for a concert. As is anywhere near the Palais Royal. I feel as if I can hear it now. It makes me smile in the most subtle way. Eric...two necks involved in playing that fiddle. (Probably something philosophical in that photo, but it escapes me at the moment). Interesting about busking laws in Paris. Doesn't surprise me. Thib...jazzin at the Castle--sounds golden man. Transport me there. Coltrane! High C's, that's a hoot. Literally. Love the picture, Eric. Ah, Paris! Thib! We came back from a tour of the Loire valley Friday, and Cheverny was our last stop! We saw them setting up for the Jazz festival. Lucky you to live in such a beautiful area. BTW, it took the bus 2:45 to get back to Paris from there. I see why you took an apt in Paris to cut down on your commute. How lovely to stroll upon a scene such as this. Eric, you have the ability to make me feel as though I am strolling the streets of Paris with you. Bless you for that. Tall Gary: yes, the Castle of Cheverny is idyllic for a concert. We used to have Operas a few years ago. Now it's jazz. Quite different, but always great ! Thib, if you want to see and hear Didier Lockwood again, just come to Seine et Marne. He has had his own concert called "Violons croisés" for 10 years. The idea is to show the width of use of violon, through ages and coutries. It is always an amazing concert. I still remember the one when he played with his "mster" Stéphane Grapelli ! Everybody was crying during the standing ovation !!! Have a nice sunny weekend everyone !! Even the street musicians are more "classy" in Paris - it's just a fact ! These outdoor concerts are wonderful opportunities to listen to live music. I'm surprised as well about the tough 'busking' laws in Paris. That is a lovely neck. I remember thinking that full-time violinists must have spent a lot of time pashing because they always sported love bites on their necks ... until I found out they were actually violin pressure marks from hours of daily practice. I was very disappointed. Coltrane ~ I hope you can stop wasting High Cs on Kleenex very soon. Love the idea. Thank you Eric. This neck invites to a sweet kiss, isn't it? eric - i hope you get some good rest this weekend. tall gary - i love your new photo - "the mona gary" "the tall lisa" "the giogary"? I saw this group last summer. They're quite good. I even bought one of their CDs. Good photo composition Eric, I generally enjoy a lot those street players. I once called my violin playing and teaching niece, Emily's violin a fiddle. She gave me a hard stare and rolled her eyes. Apparently serious violinists never refer to their instrument as a "fiddle". Hee, hee.